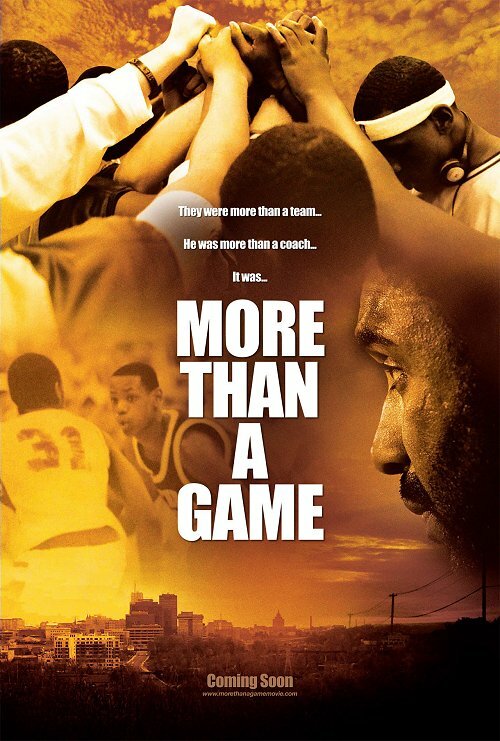 The title More Than a Game is more than a little cliché, and the most basic summary of this documentary's premise does little to refute that initial impression: the story of five inner city youths who forge something beyond friendship while pursuing their high school hoop dreams. But the journey of the "Fab Five" who made up the core of the St. Vincent-St. Mary basketball team in Akron, Ohio earlier in the decade is not exactly your average sports saga, filled with extraordinary characters and equally extraordinary circumstances that Hollywood could craft no better in any feature script. Any filmmaker blessed with such serendipitous narrative riches would be content to simply recount the not-so-tall tale, but director Kristopher Belman takes it an added step: bringing the larger-than-life back down to a universally relatable scale. Figures hardly come more larger-than-life than LeBron James, the Fighting Irish alum who (as the world over has come to know) first caught national sports media attention during his high school stint and has since become one of most celebrated and recognizable stars in all of sports, let alone in basketball. With the knowledge of James's ultimate NBA fairy tale fate, the temptation would be to focus the film solely on his rise, but his story is duly treated as but one of the threads borne out of what was originally the "Fab Four"--James, "Little" Dru Joyce III, Willie McGee, and Sian Cotton, whom we see in some rare home video honing their individual skills and team chemistry from way back when they were pre-teens. Playing in the Amateur Athletic Union, the quartet lived up to the "Shooting Stars" team name, building on their local Ohio successes to shock observers in a national tournament down in Florida; however, the four's first taste of national success will turn out to be just shy of complete victory. And, like most lives, that bittersweet experience reflects the greater journeys followed in More Than a Game. Given the presence of James, one expects this to be a film full of triumphs, but what make those resonate even more strongly in the end are the relatable setbacks, obstacles, and shake-ups that occur along the way. In fact, falling into that last category are two people who will come to complete the "fab" family and help lift the entire unit to new heights, Romeo Travis and "Little Dru"'s father, Dru Joyce II. But long before those heights, each initially enters the basketball picture under less than ideal circumstances: Travis in sophomore year at St. Vincent-St. Mary's, where his surly demeanor quickly clashes with the core quartet, who had just led the school to a championship the previous season; Joyce II in junior year, who takes over the head coaching position from a decorated predecessor despite minimal experience. How the four manage to evolve into a "Fab Five" and, above all else, a family of six headed by Coach Dru proves not so much a result of their hard work on the hardwood than of the growth they each must undergo as people. The film's structure reinforces that latter point. Instead of going the standard route of going through each person's background at the top, Belman gives the individual histories at appropriate, organic moments within the overall narrative. While this approach does mean that some events early in the film unfold without a complete familiarity with or understanding of all of the players, spreading the stories out pays off in a couple of respects. Instead of blurring into a muddle, it allows each person to have their time to shine and their respective stories breathe and remain clear to the viewer. But even more effectively, the backstories are used beyond mere exposition to illuminate certain key events that affect the group as a whole--further underscoring the greater idea of how various circumstances seemingly centered on one person can cause repercussions for the collective. Chief among these developments, of course, is the hysteria and hype that arises around James after he is featured on the cover of Sports Illustrated, suddenly catapulting midwestern high school hoops into a nationally televised arena. The film admirably does not downplay any of the well-documented dramas and tensions that then sprung forth from James's literally overnight fame, but instead of wallowing in sensational celebrity scandal, Belman keeps these developments in their proper perspective in regards to the bigger picture: how they affected the entire group and what they all aimed to accomplish. That is an example of how and why More Than a Game works--showing the grounded, real-life terms and consequences of an increasingly surreal chain of events. Only a select few people can completely relate to being blessed with natural athletic ability and talent at such a young age; even fewer still would relate to being suddenly thrust into the media spotlight and scrutiny. But underneath that gloss and glamour is the classic tale of boys growing into men, of people learning the importance of the greater group glory over the individual shine, with the distinctly drawn personalities of each of the five offering a fairly diverse set of entry points for the viewer to understand and relate. Ironically enough, in balancing his attention between everyone on the team, Belman offers deeper, uncommonly intimate insight into the film's marquee name; one is a witness what is perhaps James's most critical, formative period through the eyes of those who not only knew him best, but had a huge hand in shaping the superstar "King James" so familiar to sports fans today. But if lifting-oneself-from-a-hard-knock-childhood-through-big-dreams is fairly commonplace film fodder, More Than a Game's trump card comes in an arc that is not as commonly told and even more empowering: the story of Coach Dru, as the film is just as much about him coming into his own. If James's story confirms the prevailing contemporary notion that one's opportunity for success comes--and then passes--only while one is young, that of the elder Dru counters that, rather poignantly proving that one does not have to settle for comfort and complacency, for one's true calling and self-actualization may not arrive until later in life. That statement may make More Than a Game sound pretentious, but such weightier ideas are delivered in a very accessible and entertaining package. The Fab Five make an affable and appealing, funny and fun group, and Belman accordingly has fun, fighting the trap of talking head-and-news-clip documentary monotony and keeping the film visually dynamic. Beyond some snazzy (but not overdone) graphic work that gives the documentary staples of old photos and newspaper headlines some motion and flair, Belman also manages to lend some variety to the basketball footage, with each pivotal game edited and presented in their own subtly distinct way; for instance, some visual repetitiveness is avoided by simply not shooting scoreboards in the same way. Belman even has a little fun with the standard closing "where are they now" text cards without resorting to overwrought editorializing or labored stabs at profundity. While it certainly helps to be familiar with the game of basketball and a fan of the sport to enjoy More Than a Game, it is far from necessary. Basketball is what brought the Fab Five and Coach Dru together and was and remains a shared passion, but the game is almost incidental to the larger idea: not only that those from not exactly the most privileged of backgrounds can indeed dream and succeed, but that one doesn't necessarily do it by oneself. Not looking out for number one but instead always looking out for each other is what made Coach Dru and the Fab Five what they were as a team, who they have become as people today--and why their story and this film are so richly moving and inspirational.